DEEPWATER HORIZON could have easily taken an exploitative route and become the typical disaster flick. Think POSEIDON ADVENTURE. However entertaining such a film might be, in this case it would have been a disservice to those who perished in the most significant oil rigging accident in history, which caused a spill that still has lingering effects on the Gulf Coast some six years after the fact. Instead, the filmmakers behind this story, which obviously takes some dramatic license, choose to concentrate on trying to tell a tale fraught with plenty of drama. Every scene in director Peter Berg’s film rings with some element of truth. Each situation within the film is allowed to stand on its own with respect to evoking an emotional response and while the film’s strength are those emotional elements, there’s little doubt that Berg (STATE OF PLAY, FRIDAY NIGHT LIGHTS) captures the epic nature of this accident and all of its tragic beauty with his camera’s eye. He trains it on three principles – Mike (Mark Wahlberg), Jimmy (Kurt Russell) and Andrea (Gina Rodriguez) and their compatriots on the Deepwater Horizon drilling vessel. Directing from a screenplay by Matthew Michael Carnahan and Matthew Sand, he dives right into what’s to come. Jimmy and Mike get a bad feeling from the start as they board the ship for their 21 day stay and realize that a crucial inspection has not been made. Jimmy, who’s genuine first concern is his crew, has to verbally and mentally spar with BP bureaucrats, led by Vidrine (John Malkovich) who only have one thing on their minds – profit and making up for lost production time. Vidrine willingly pushes the limits of the Deepwater Horizon’s systems during tests, essentially ignoring data and safety protocols. Reluctantly, Jimmy goes along with Vidrine’s assessment and allows the rig to begin work. Not surprisingly, tragedy and horror strike when the Horizon turns into one huge fireball, forcing its more than 150 crew to try to find a way to get off with their lives. DEEPWATER HORIZON walks a fine line between point the finger of blame and dealing with the heroism of those affected, who were many. Although the audience would be reasonable in expecting Wahlberg to dominate the film, that’s not the case he and others turn this into an ensemble affair. That’s not to say Wahlberg doesn’t do any heavy dramatic lifting. The opposite proves true as he delivers an intense but measured performance as does Russell as the wise “old man.” Malkovich produces his moments and resists the urge to turn Vidrine into little more than a villainous caricature. 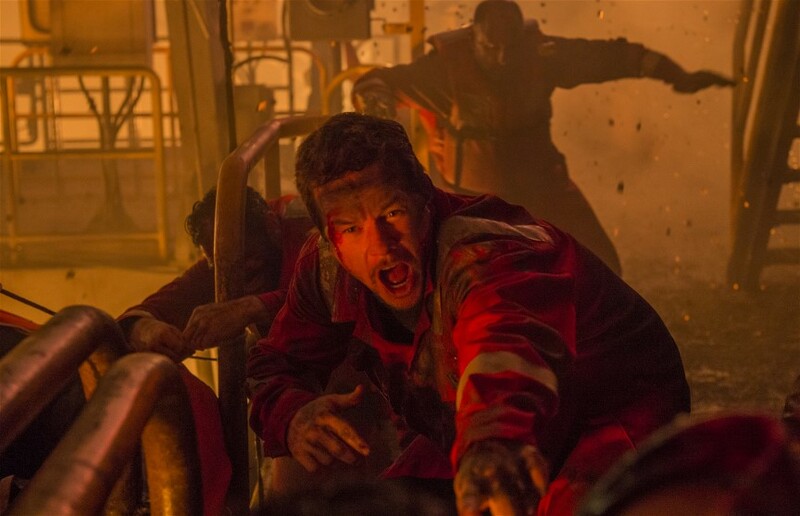 DEEPWATER HORIZON takes the audience through a harrowing experience with top notch performances, thrilling moments and memorable visuals.